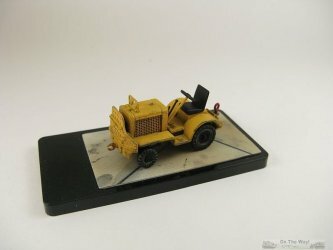 The first Clark Clarktor 6 tow tractor was introduced in 1927, designed specifically to pull airplanes and warehouse trailer trains, remained in production until 1987. During World War II, from 1941 to 1945 Clark produced almost 90 percent of the military requirements for fork lift trucks and tow tractors. There were at least two versions of the Clarktor 6 produced that I have been able to find - one identifiable by single wheels on the rear axle and another with dual rear wheels. 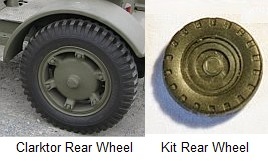 The dual wheel version was used by Britain as the British Heavy Model, of which some 1,512 were manufactured for the "British Ministry of War Transport". It appears that ehe USN also used dual wheel versions during the war. The single wheel version appears to be the one used primarily by the USAAF and was provided to other countries under lend-lease. This is going to be a quick preview/review of the Clarktor 6 offered by Academy. The best way to describe the format of this review is to borrow the title of a famous Spaghetti Western movie, and present the kit's points as "The Good, the Bad and the Ugly". The Academy Clarktor was released ca. 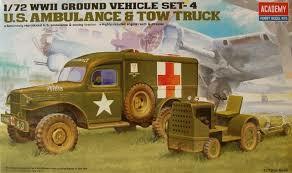 2005, along with a Dodge WC54 ambulance. Initially response to it was positive, but that has been tempered with time as it was found wanting with respect to its accuracy. Although it is quite good with regards to molding quality and fit, it does suffer from some very noticeable accuracy problems. Detail is a some good, some bad proposition. The body, hood, frame and Chrysler flathead 6-cylinder engine are usable. Molding is crisp, and parts fit is excellent. The modular design makes it easy to construct the kit in separate sections, paint them separately and then join them together at the finish. Some parts do have a bit of flash and there are a bunch of egregious ejection pin marks on the undersides of parts like, the fenders and frame, which should be filled. 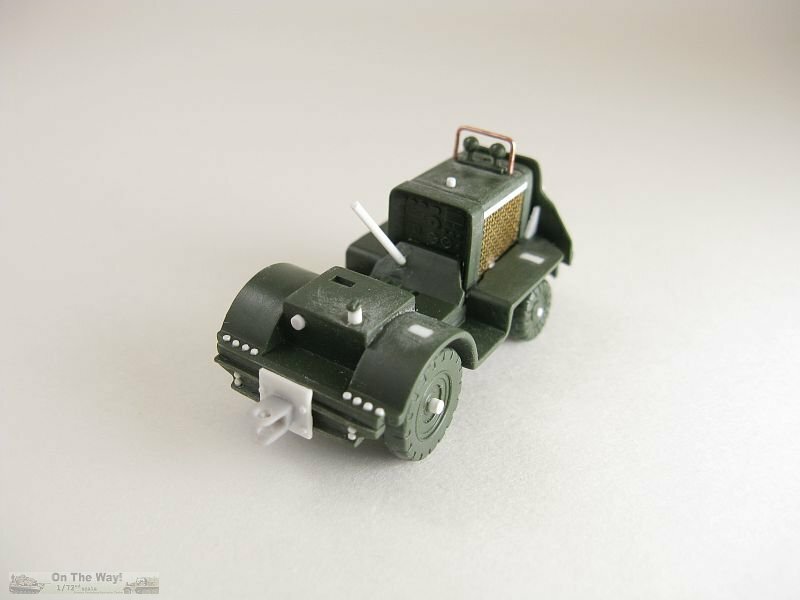 Some detail is missing, such as a muffler and exhaust pipe. Now I get to the primary reason for this review. Let's start with the wheels/tires. Both the front and rear tires, along with their associated wheels, are atrocious. 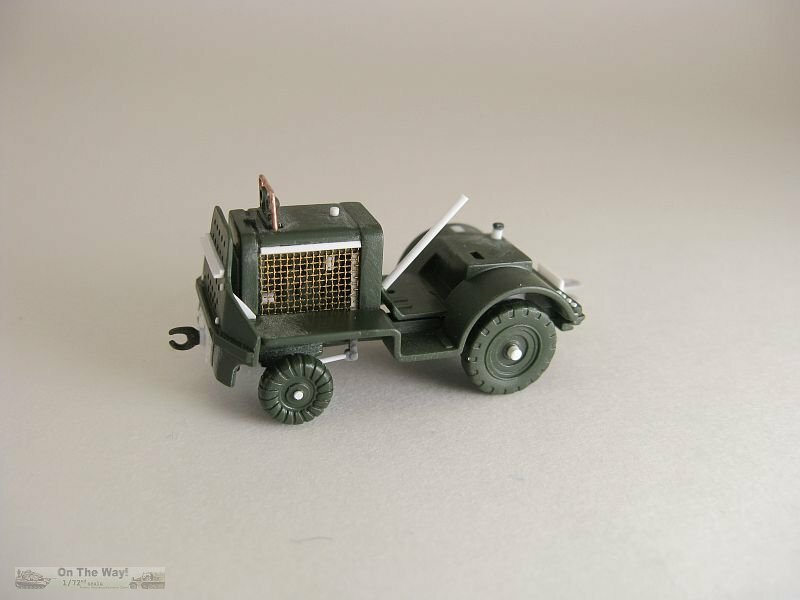 The rear wheels are featureless and lack the prominent spokes seen on wartime Clarktors, while the front wheels lack the recessed disc. The rear tires have next to no tread, and what tread they possess is not accurate. But they are at least somewhat palatable compared to the front tires. The front wheels exhibit more tread than the rears, but this tread unfortunately looks more like a rolled up millipede than a proper tread. 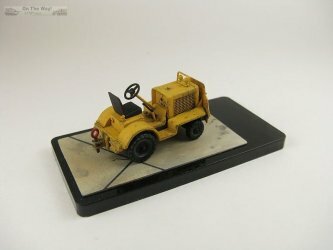 My best guess is that Academy tried to replicate the tread pattern see on the restored example seen above. 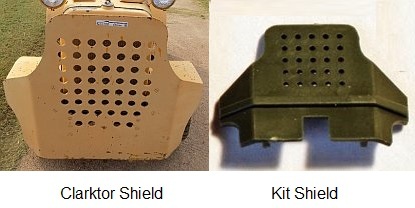 Then there is the inaccurate front shield. The kit has 5 holes per row, whereas the real Clarktor has 7 holes per row, plus the row count is incorrect. Not sure how this error passed through the design stage. The dashboard is suspect. 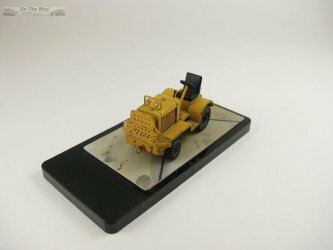 It has too many gauges versus what I've seen in photos of period and restored tractors. Also missing is the prominent can-like structure on the right side of the dash, which I guess may be the engine air cleaner. Retained the wheels/tires as they were and simply added axle extensions. Ignored the lack of holes in the shield/bumper and justified it as a "local/one off" modification, adding a push bar and a towing pintle. I used this build as an opportunity to test a new technique using "Bondic" - a clear resin that's cured with UV light - to make clear lenses for the headlights and tail light. Following painting, I punched a pair of small discs from a chrome plated sequin and glued them into the headlight openings. To the tail light, which had been previous drilled to make a small hole, I added a drop of gloss red paint, and once everything was dry a drop of "Bondic" was added to all the lights using a toothpick and cured with the enclosed UV light. It worked well enough that I will use it for other builds. 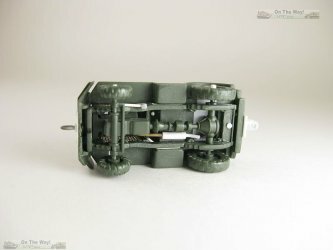 For those wishing to build a WWII era Clarktor, this kit fails miserably as a replica of those used on airfields during the war. 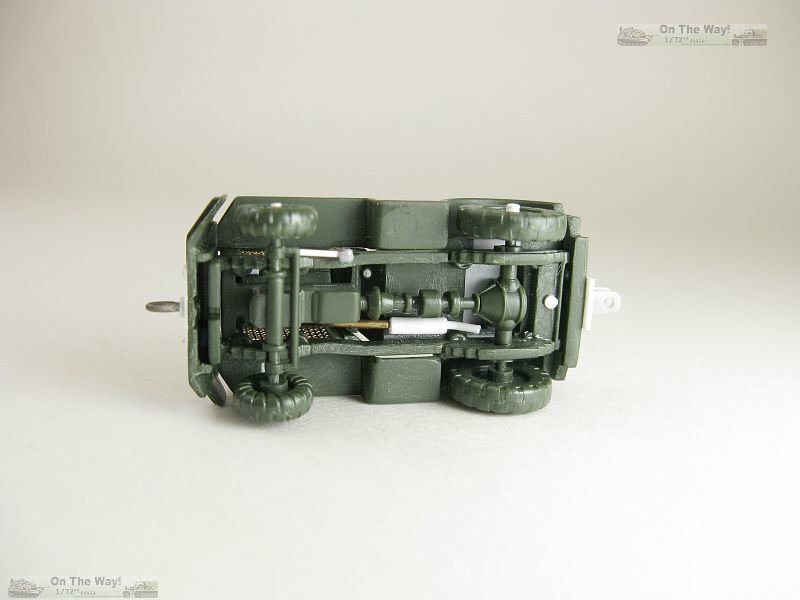 Accuracy issues will force serious modellers to make major modifications, either by scratchbuilding what they need, or finding a suitable third party detail set, or looking for a replacement kit from another manufacturer. A Google search provides so many photographs and links to Clarktor 6 tractors, both military and civilian, I will only provide a few a few select references below.